Last week I attended Alt Oasis, better known as Alt Summit, an annual conference for (female) influencers and creative entrepreneurs. Disclosure: I was given a free conference ticket in exchange for providing this recap, however these thoughts are 100% mine! Alt Oasis was the 10-year anniversary of the Alt Summit conference, with over 1500 attendees, or so I heard. There were definitely some hiccups (any hungry vegetarians out there? ), but overall the conference was a rich educational experience with lots of opportunities for genuine relationship building. I had never been to Alt Summit prior to this past one, but I had been interested in going and I was definitely curious about what it was all about. I was super excited when I was accepted as part of the Volunteer Social Media Team via We All Grow Latina and only hesitated for a few hours before I booked a flight. My March travel schedule was already busy, but I couldn’t say no to a week in Palm Springs! I’m a southwest girl, so I’ll take any excuse to get out to the desert. However, I was definitely intimidated by the conference being that it is for influencers. I am not an influencer, and I decided a while ago that I don’t want to be. The thought of having to take a photo of every casual-for-me-amazing-for-someone-else experience makes me sick. I am a pretty private person, but in running my own business I’ve had to start putting myself - me and my life - out there, so even though I’m not an influencer in the sense that I have a huge social media following, I do need to be on top of social media and marketing so I can get business and get paid! Anyway, upon boarding my direct flight from JFK to PSP, I started feeling really lame. There were two women in front of me in line who were dressed like they were NYC influencers -- casual yet chic, luxurious yet everyday -- and they were talking about Instagram and their second book and photoshoots and I thought oh no, I already feel out of place. I’m not gonna jive with anyone at this conference! Then I watched two and a half movies and tried to chill out. Once I got to my hotel, which gave me a welcome shot of scotch and had a pool view from my upgraded room, I felt better. That is until I started unpacking and immediately questioned every single outfit I had brought for the conference. I frantically called my sister who gave me a dose of confidence and then tried to find a taco shop in walking distance. There was none so I went to bed. The next day I ventured out to register for the conference. It was technically day 2 (Monday), because it had started on Sunday, so it wasn’t terribly crowded at registration. I got my badge and went in to Joanna Gaines’ keynote interview. I looked around and while it was a mostly white crowd there were some other women of color and not everyone looked like a fashion blogger. Joanna shared insight into how she started and why she has stayed in Waco, Texas. She said she had been working at her dad’s Firestone shop for ten years before she met Chip and that she definitely questioned why she chose to stay in Waco when all her friends were moving to big cities and making lots of money. She also shared her ups and downs and how she stays grounded through it all by focusing on her family and her faith. She talked about the realities of owning your own business -- the business is always there and you’re never done. I liked how she emphasized being authentic and being yourself since being different is the only thing that will help you stand out. I also appreciated her grounded-ness -- she still doesn’t have a tv. She shared how she and Chip have basically done the opposite of what is popular or trending, which is interesting and I imagine even if her business(es) hadn’t blown up she’d still be doing something similar. After her talk, I went to say hi to a friend, Kelly Rand, who founded Handheld Handmade and was doing a book signing for her book Handmade to Sell. Reconnecting with a friend made me feel more comfortable and pumped for the rest of the conference. We grabbed some rosé and got on a shuttle. The conference took place at four hotels: The Riviera, The Saguaro, The Ace, and The Parker. The Parker was by far the most luxurious, so much so that you had to take your badge off to enter. I luckily had two lunch tickets for The Parker. The Ace and The Saguaro were kind of like stylized motels, but for the conference purposes had adequate rooms for talks. The Riviera was more of a classic hotel and had the main conference ballroom and various spaces that housed the bookstore and pop-ups. It took about thirty minutes by shuttle/car to get from The Riviera to the Saguaro, so you really had to plan out your day keeping in mind the transportation from one hotel to another. I wish I had known that in advance because I had to rethink my whole conference plan once I realized how far apart everything was and that I most definitely could not walk. The conference consisted of talks, roundtables, mini-talks, and workshops that covered a wide range of themes, including content, marketing, branding, business development, book publishing, photography, and finances. There were also maker workshops led by artists and designers, but those filled up pretty quickly! Oh! And meetups -- I hosted a meetup Wednesday night called ‘Brown Ladies Unite’ and met an awesome group of women (and men!) of color. We shared our own backgrounds and businesses as we sat by the pool. We also discussed how we can support each other and be more ourselves through our online presences and businesses. Over my four days at the conference, I attended talks and workshops on flat lays by Tamera Darden of Darden Creative, on video and YouTube by Trena Little, on public speaking by Maisha Dyson, on branding by Dayna Lapkovsky of Suite 203, photography by Kylee Maughan of Kylee Ann Photography, and on book deals by Brittany Jepsen and Mary Nielson. I also went to round tables on pitching by Liz Martin of The Charleston Weekender, on content creation with Carly Morgan, creativity by Jessica Litman of The Organized Mama and Katy Krupnik of The Tidy Cottage and more! I went to a book launch of Buy The Change You Want To See by Jane Mosbacher Morris and got freebies from sponsors like a box of Tombow pens and even a popsocket from LaCroix. We also got to pick our own swag at the opening night gift party! Unfortunately, the gorgeous earrings by Cotton and Clay that I picked were lost and broken by the end of the next day. I learned a ton in each talk. Some were better than others, but each talk reinforced the reality that there are women all over the world creating their own businesses and being successful at it. For some women, success means lots of money, for others, it means enough money while still having time/energy to raise a family, and for many women it means both. It was inspiring to see so many women doing so many different things and finding success through their businesses, then sharing what they learned with us. 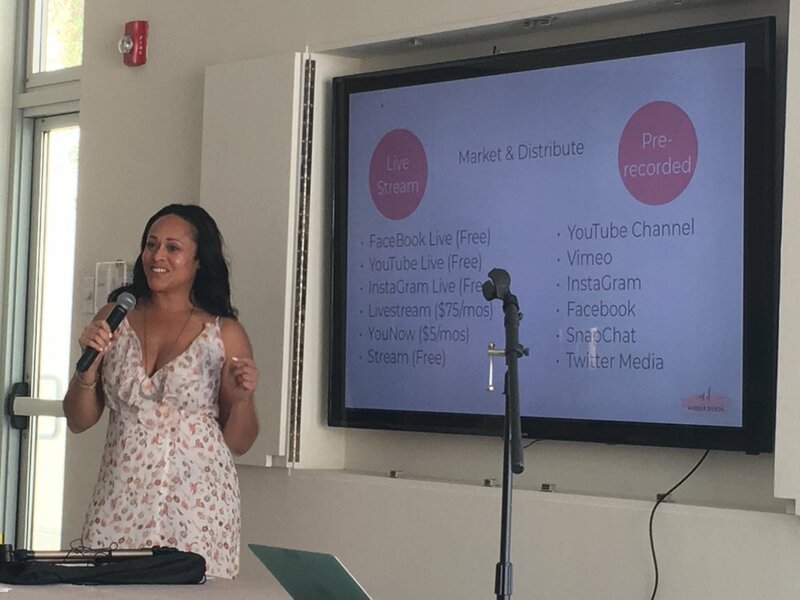 The information was definitely overwhelming and it was absolutely fueled by anecdotes, yet it was still valuable and most importantly, made me feel like I have this world of ladies to turn to when I need inspiration or tips for something specific in my business. The closing keynote was by hand letterer and business woman Jessica Hische. Her background and journey to her current niche in hand lettering was interesting and I appreciated her approach to business and creativity. She also gave great advice -- figure out what things you can do that no everyone can do and focus on that. Her talk rounded out the conference for me and gave a nice little push for us to keep on keeping on, genuinely and without following anyone else’s path. At the end of the day you have to work with what you got -- you can look to others for some tips, but you are unique and have to do what’s best for you, at your own pace, in your own way. This quote by Jessica really stuck with me. She was referring to looking at other people’s work and feeling bad about your own or comparing yourself to others. She said “You’ll never work to their level, because you’ll always be three steps behind, because you are not at their level—so focus on where you are” -- which is exactly what I intend to do! If you are like me, you want coffee in the morning. It seemed like there never was enough coffee by the time I got to the first sessions, so I made a point to just get it elsewhere (like at Cartel or Koffi). This was also a good reminder to take care of my own needs first so I could show up ready to learn and connect, instead of being annoyed that there was no more coffee. Also, make sure you are comfortable -- that might mean walkable shoes, a hat for the sun, and carrying some snacks in your bag so you don’t get hangry. Whatever you plan on doing at the conference, plan on doing 50% less and instead give yourself time to just wander around. I made the best connections lingering at lunch or waiting for the shuttle. If you plan to try and attend every session and don’t give yourself any slack then you won’t enjoy yourself and you probably won’t meet that many people. You’ll also miss out on all the amazing sponsor booths and freebies! Attendees really showed up and everyone was wearing what seemed like their favorite outfits, so go ahead and bring all your swimsuits (if they bring you joy), because you will probably want a different one every day for late-night lounge networking. There were plenty of photo opportunities -- from sponsor booths to hotel glam to desert landscapes -- so be camera ready! From viewing the lobbies of all the conference hotels, and hearing about the noise, I highly suggest booking a room at the Villa Royale. It was quiet, beautiful, and provided some much-needed decompression after a long day of being on. It’s also across the street from the Ace, so it’s easy to grab a shuttle to the other hotels. If you are more adventurous or on a budget, consider camping, which I also did with my sister in her refurbished van. I think the best part of any conference, and especially this one, is to make connections. But connections don’t mean anything if you don’t follow up! If you are genuine you will likely meet at least a handful of people you’ll want to talk to again. Get their card or make a list of who you want to stay in contact with and email them. Use the app as a resource — there are so many amazing women in there! The blogger/influencer community is very, very strange, but people are friendly! Don’t be intimidated (like I was) just jump in and be make space for yourself. You’ll either be accepted or you’ll create your own community within — in my cause I think both happened!